In August, 2014, an ad hoc coalition and ever-changing group of autonomous activists prevented the Zim Piraeus from offloading for four days and caused subsequent entanglements that prevented the vast majority of its cargo from touching dry Oakland land. Much has already been said about the relationship between labor and the BTB coaltion that was necessary for such a monumental win. I would like to speak of another hand in hand relationship that received less attention or press, but was just as important, and perhaps even more so, to the final impact of the Block the Boat coalition’s unprecedented victory in Oakland. That relationship between organizations in the Bay Area organizing scene that comprised the Block the Boat coalition and action taken through existing solidarity networks and individuals, acting autonomously. To understand the remarkable victory of Block the Boat, Oakland, one has to first trace the line of this uneasy partnership, and the incredible feedback loop it unintentionally unleashed, amping the Block the Boat signal higher and higher towards success*. 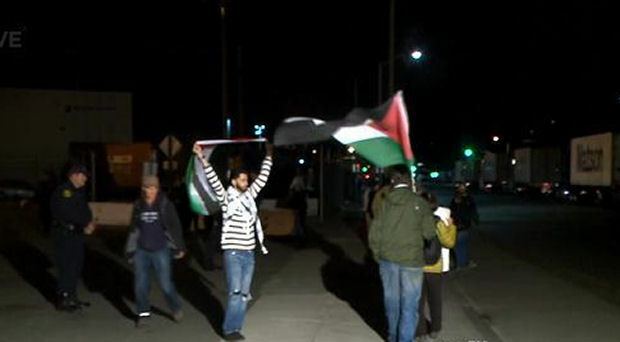 2014’s Block the Boat began at the end of an otherwise dreary pro-Palestinian [and pro-Immigrant] rally, with an uncharacteristically high, and thus, indicative, turn-out of about 100 people marching listlessly in a circle in front of the Federal Building in Oakland. At the end of the action, a call was made by some organizers to create an ad hoc assembly to discuss the possibility of blockading a Zim shipping lines ship. From the outset, the assembly made it clear that they sought to emulate the successful action by a coalition of labor and social justice groups in 2010 which blockaded a Zim ship for two work shifts as protest against the Mavi Marmara atrocity. Zim, an iconic Israeli company with ownership, voting and vetoing power vested in the state itself, was seen as a perfect BDS target–emphasis on the S for sanction, especially for those at the assembly who wanted to bring BDS further into the direct action sphere. The atmosphere was charged with anger and sadness about the shocking death toll in Gaza at Israeli military hands, the sense of urgency was palpable. The crowd was relatively diverse–if not in terms of class, race, and affected representational parties, in ideology, affiliation, age and gender. At the end of the assembly, the group hastily decided to try to organize to block a Zim ship at the Port of Oakland on Saturday August 2nd, 9 days hence. Obviously, they had to move quickly under that deadline. Fliers without institutional support of any kind were being passed out by that Saturday at a huge pro-Palestinian march in San Francisco. Lots of balls were already in the air. Many expected labor solidarity, and rank and file ILWU support to trickle in—and indeed, on a limited level, it had already. The participation of Arab and Palestinian organizations was assumed to be forthcoming, despite the fact that the short time frame necessitated moving fast and perhaps skipping some formalities. Then an unfortunate game of unprincipled activist telephone began, with rumor-mongering activists who’d had nothing to do with the organizing to date, and no real connection to ILWU or Palestinian issues, claiming that the ILWU had not been contacted, and that the organizers were not planning to contact them. This refrain echoed and reverberated through the rumor mill, and combined with other factors, contributed to larger organizations with the pull to bring in thousands of people to balk. In the end, an uncomfortable agreement between the ad hoc group and more formal groups was made, where the date would be put off for two weeks, while the organizations explored a relationship with workers and did the outreach and organizing for a massive turnout. This was the kind of sausage-making that made few people happy. Many in both camps felt emotionally torn at delaying action during the most shocking loss of human life in Gaza from Israeli attacks. And, of course, there was unprincipled internal and external grumbling that created a toxic and difficult environment for ongoing efforts. But the possibilities of bringing out thousands to a new kind of Pro-Palestinian direct action was worth all of these difficulties for those that pushed forward. A new Block the Boat coalition was formed with a target date for August 16th. What came next, however, took everyone by surprise. One lone organizer decided they didn’t like the outcome, and started a new Block the Boat Facebook page, denouncing the new Block the Boat coalition who’d agreed to delay as “pro-Zionists”. The confusion was worrisome, and it seemed certain that the counter-organizing would adversely affect the organizing—the concern that those who hadn’t heard about the delay at all, would show up to the now off-kilter organizing shitshow, and the resulting ineffective group would cause negative repercussions for future attempts. August 2nd, came and went. Only a small group appeared at West Oakland BART at 5am. They neither rallied, nor marched. But, in the first of a number of beneficial side-effects brought on by autonomous organizing, one important bit of information was gleaned. The Zim ship scheduled to dock that morning had begun to slow earlier Friday, and had come to a standstill in the deep seas—apparently, to wait out any organizing attempts that might lay in store. This knowledge—that Zim was fearful enough of a negative outcome that it would waste time and money idling at sea, and that Zim was capable of delaying its boats for an unknown amount of time—would come in handy later, and played a pivotal role in subsequent events. The BTB coalition’s organizing continued with a dizzying list of endorsing and active groups. Knowing that the vessel could and would delay for an unknown period added an ungainly moving part to the planning that affected every aspect of strategy. Not knowing what to expect from the workers, port security or police, the coalition worked toward a massive turnout that would reset the playing field on Maritime street, leaving very few options for the port as a unit, and perhaps winning over rank and file in a person to person context. Moreover, the formidable logistics–how to get the right amount of people, at the right time, safely to the port and to the right terminal entrances—was a daunting obstacle. All of this took place within a loose umbrella of organizational planning, with individuals and organizations working together. As the day approached, the most problematic possibility—an indeterminate delay in the ship’s arrival—occurred as predicted. Organizers had prepared for the eventuality by setting up a text blast system to notify people of last minute changes to the day’s plan and schedule. The question remained about how flexibly a possibly 1-5,000 strong mobilization could be brought to West Oakland and marched to the appropriate gates with the possibility of 12-24 hour delays. The concern was two-fold: yet another delay might cause supporters to lose interest or refer to toxic narratives about the organizer’s intentions; the ship could be underway in less than an hour and could still make a late day gangcall and offload. As the crowd began to form, the boat was still pirouetting off of Monterey as it had been for 12 hours, hoping to wait out the onslaught. 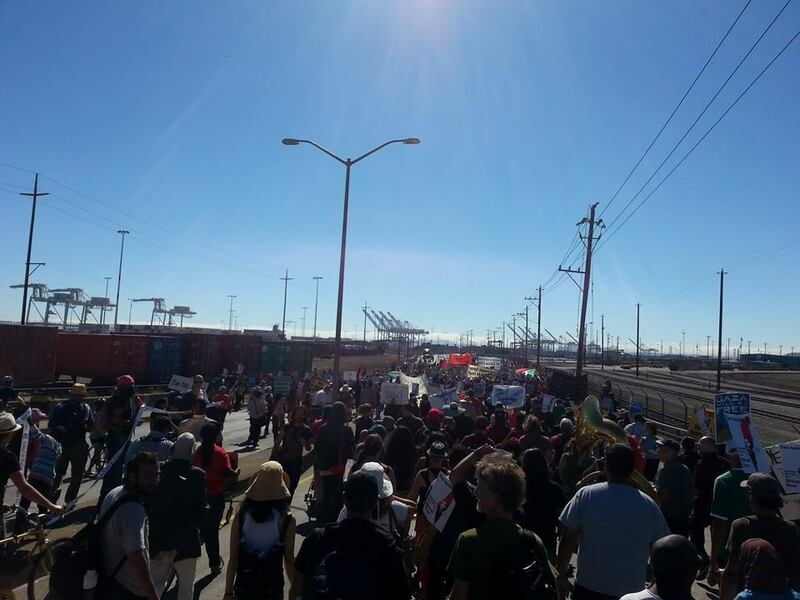 The 2 to 3 thousand strong crowd marching from West Oakland to the port was transcendent, an inspiration to all who witnessed it, including Port workers. 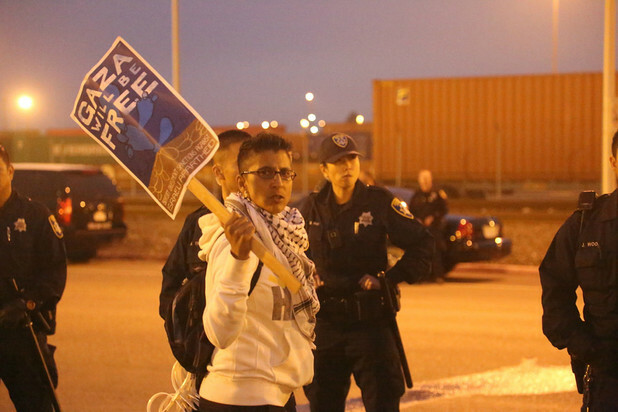 In my life of political work, and as a Palestinian-American, it was the single largest group I had ever witnessed gathered for a target-based direct action—indeed, I had not seen such numbers since Occupy Oakland’s one-hit wonder Port Shutdown of November 2011. By the time the march hit the apogee of the Adeline overpass to Maritime, the announcement was given that the Piraeus was still at sea, and we were to declare victory at their delay. The large crowd moving toward Zim’s future berth sent a clear message about the capacity of this new movement. Indeed, when the assemblage arrived at the designated target entrance, the 40 or so strong line of cops were engulfed by the human mass. The chants changed from Free, Free Palestine, to Hands up Don’t Shoot, in the perfect mirror of the current mood on the streets of Ferguson, Palestine and the rest the world under siege from armed police and soldiers. The blockade turned victory rally was inspiring, unique, and passionate. The victory itself at that time was modest compared to the final tally. BTB had kept the ship at sea for over 12 hours, and ensuring that another 12 would pass before the boat could be unloaded. But it was also spectacular, in terms of organizing and turnout. It gave a clear message that the organizers could turn out the numbers necessary to block worker entry in a definitive way, with little lead time and in an unpredictable timetable. The coalition had proven that Piraeus’ fear at meeting a huge and impenetrable blockade was merited. The actual impact of having a real-world effect on the state of Israel, with so many bodies ready to participate, can’t be exaggerated—and, indeed, that first taste is what probably inspired many in the autonomous organizing to take further steps. The debate remained for decision-makers in the coalition about how to deal with the boat when it finally came into port. Still, no one knew how long the boat would stay at dock trying to unload, or how long organizers could keep up the mobilization. But as it turned out, most of these questions were answered by simply stumbling forward in the imperfect way organized-organic mobilizations occur—which is, never according to plan. The Piraeus kept doing donuts off the coast of Monterey, and missed the next possible shift for Sunday morning, but later that day, it began moving towards the port. The decision to mobilize for Sunday night, when the ship was headed into harbor was made in fits and starts, and the text blast was made with very little advanced notice. Still the mobilization turned out over 500 picketers, an assemblage, that, despite being much lower than the already demonstrated potential due to the late call, couldn’t be argued with at the port. Every conceivable entry gate was well-covered. Police and workers stood down—according to Local 10, the latter due to the presence of the former. Delaying the boat for two days was judged a big enough victory to end the mobilization and prepare for next steps and another possible blockade. The organizing had already far exceeded expectations–during planning stages, organizers had considered a successful blockade of two shifts to be an A+ victory. The alternative now was losing the gamble and appearing diminished at the port in another block effort. The predominant concern was holding on to the hard-won success, and not having it tarnished with dwindling final counts and the biased media that would exploit them. This was a very real concern. Mainstream and local media had largely ignored the original and most awe-inspiring mobilization, when they were not objectively lying about it—KTVU’s egregious and unprincipled crowd estimate of “over 100” being a particularly dishonest and unprofessional example. The Oakland Tribune’s absurd invention of a 500 person-strong Saturday crowd was not much better. This was not the calculus being carried out in the minds of many whose first steps in the mobilization occurred Saturday, August 16th, and not in late July. Throughout the crowd, the question of “what time do we come tomorrow?” began to reverberate, a question the coalition organizers had never considered and were unprepared to deal with. Rather, anticipation had always gone the other way. In the planning scenario with the Zim ship arriving in the wee Saturday hours, and the mobilization starting at 5 am, doubts about turnout haunted organizers. Beyond the extreme hour, BART wouldn’t be running at that time. No one was sure whether people would roust themselves out of bed, and if they did, how they would get to the West Oakland BART station. And then, if there was a successful blockade, how to convince everyone to come back at 5pm to shut out the day’s shift. Predictions for all these contingencies ranged from unimpressive to dire. The coalition had decisively answered all these questions. It brought upwards of 3,000 people out on short, rolling notice. It had kept the ship turning agitated donuts at sea, and foiled it when it came to port—four shifts in total. This is even more remarkable in the context of a regular Zim schedule at the Port, which has the ship entering and leaving on the same day. The coalition proved that it could easily do this, that a two-day delay would be the bare minimum that Zim could now expect from organizers at the Port of Oakland whenever a Block the Boat action was called. But the question remained about how long such efforts could be successfully extended. A small, but diverse crew entered that void. They were brought together in Sunday night’s excitement—a mix of those who’d joined the mobilization on Saturday, and others that had been organizing and agitating outside of the coalition since the first autonomous picket was called for in late July. They returned Monday morning, numbering somewhere around 20, and trying to cover the same five gates. The police pushed them aside early on. It was only hours later that word got out that Local 10 had declined to cross the picket line, again citing dangers from police presence, which was absurdly large given the turnout. The ad-hoc picketers in turn, began to agitate and complain that they had been left in the cold by coalition organizers who did not make a call out to support them. A call for autonomous actions for Monday at 5pm was made via autonomous networks, and rebounded with added volume on twitter and Facebook. No official call to action from the coalition was issued, but by this time, coalition members were also well-represented in the autonomous organizing. The autonomous call went out through personal networks, and social media, but with so little lead time and no text blast, barely a 100 showed at first. Monday evening’s picket would not be as easy as Monday morning’s, despite having a larger assembly to rely on. Police deliberately broke the line, as they had done in the past at port pickets. They pushed the picketers into port traffic, which at that hour included semi-trucks as well as cars. After a brief hail mary milling around in the street as a way to extend the block, picketers were finally herded behind pre-set barriers, where they could only watch as cars began to trickle into the entrance. Again, at the last moment, Local 10 tipped the balance by claiming a health and safety concern. When all looked lost, workers stood down—the last of those who’d crossed the picket driving out in a steady line the same way they’d come in. 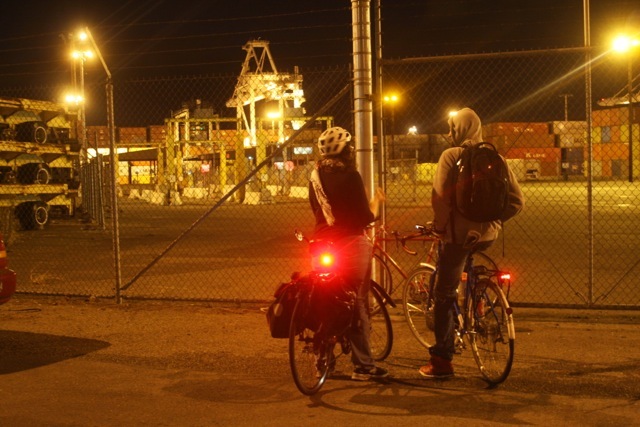 Coalition organizers, who had been working behind the scenes in support of Monday night’s autonomous action, were inspired by the win and made a last call-out that night, gambling that one more blocked shift could force the ship to leave port without unloading a single container. That would be a victory far beyond the expectation of every person who’d joined the original coalition organizing efforts. Even workers at the port doubted the likelihood of that scenario [or so said more than one I spoke to on Tuesday morning who suggested we pack it in]. The call-out was made pre-dawn Tuesday morning, about 100 responded. It was enough—the ILWU did not dispatch a gang to unload the ship. The rumor began to circulate that Zim Piraeus would be leaving shortly. Around this time, after the crowds had left, another set of rumors started to make the rounds. The first was that the ship would try to unload “perishables”. A concurrent rumor came quickly after that the ship would be redirected to Ports America on the far side of the port. It was difficult to make any sense of the interrelated rumors—if the latter were true, then there was a short period to mobilize to a completely unknown terrain, where the gates, terminals, entries and parking situations were a total unknown. If it was false, it could simply be a lure to have organizers send everyone to the far side of the port, leaving the SSA terminals undefended for workers to cross. Yet, another possibility was that it was a tactic by SSA to hurt their competition and BTB with the same stone—sending their 4 day migraine to Ports America while encouraging picketers to sew bitterness into their relationship with longshoremen by blocking workers dispatched to work another ship. Finally, it could simply be a test of the organizer’s wherewithal, to see if they began to mobilize with social media as the gauge, and to move in if they hadn’t. The coalition balked at the impossible logistics, and no call was made. The potential benefits did not exceed the value of the previous victories. As the boat began to motor out of the harbor and into open sea that afternoon, many, both in the coalition and without, began to give in to the idea that they had finally won, and that the boat was on its way to another destination. Zim, with the help of the Israeli consulate in San Francisco, had gone the extra mile and faked a press release, pleading surrender and huffily exclaiming their intent of sailing to more welcoming harbors. Congratulations began to make the rounds. Just a few minutes later, people watched in shock as the boat slowed at the Farallon’s turned around and jetted back to the Port at 15 knots, indeed, apparently headed for PA. Autonomous organizers would not be deterred. They again pressed interpersonal networks, especially twitter, into the organizing and made a last minute dash to PA terminal, literally racing the boat to the berth. The crew of dozens who responded to the call, of course, had no idea what they were doing or where they were going. It took more than an hour for those assembled to even figure out where the parking lots for drivers were—and indeed, where the berth was, and what it’s relationship was to the parking lot entrances along the street. By this time, various sources had confirmed that there would be no specific gang-call for the Piraeus. This meant that PA would most likely transfer workers from another ship in dock at PA to the Piraeus to avoid the picket line, forcing picketers to pointlessly alienate workers headed for another boat, or have to stand-down completely. This was soon confirmed by disgruntled workers, angered by the PA’s tactic for reasons of their own, who took some picketers into their confidence. “Selling” a gang to another boat was a bright red line for workers—something that would never have happened were a contract in place. Picketers heart’s sank. This meant nothing the they could do with their physical presence alone could keep the Piraeus from being unloaded. Remarkably, however, pro-Palestinian direct action found common cause with the longshoreman’s labor struggle on the streets and entry-ways of the port. Word spread that longshoremen were staging a work slowdown, their own protest against Zim and PA’s tactic for bypassing the picket line. This changed the playing field. If the previous series of leaks could be believed, Piraeus was only being allowed to offload perishables and high value goods, and even so, with an antagonistic work slowdown in effect. Picketers received encouraging news that health and safety concerns about pickets and police continued to be an issue for workers leaving for lunch; workers returning from lunch might not try to cross a dense enough picket line. PA fearing the health and safety stand down, went as far as buying pizzas to lure workers into staying in for their lunch hour. But the absurdly managerial thinking failed miserably. When workers returned from lunch, brief, but glorious, chaos ensued, as management, reportedly with the help of the business agent during the shift, tried to lead workers into any gate where a car could conceivably be parked without running into a picketer. Picketers in cars and on bikes raced to other gates, half a step ahead as sources relayed intel about management’s next ploy. The gambit had a good run, but around 1am, enough workers had been funneled in through alternate entrances to continue operations. The ad hoc group watched as the crane began moving cargo off of the Piraeus, indicating that any role they had to play for the night was over. The slow-down remained in effect. Sources suggest that only 26 of 176 containers bound for Oakland were unloaded, though this hasn’t been confirmed. Few if any of the picketers left that night had been around for the original organizing rounds. They met in an ad hoc assembly in front of the parking entrance of Ports America. They felt that they wanted to see their action through, and that they had another chance to lobby supportive workers, or barring that, make common cause with the minor workplace insurrection. They agreed to meet again at 5 am the next morning. Workers stood aside Wednesday morning, honoring the picket line, despite knowing that the ship had partially offloaded and would soon be leaving. Eventually, the picketers dispersed, after making sure that the boat left the harbor. After the five day saga, the Piraeus left the berth, but then anchored in the bay outside of Hunter’s Point. This caused some last minute consternation, before the ship finally departed for deep sea some hours later. In the aftermath of the wildly successful action, there have been unintended benefits. While ILWU Local 10 has not officially endorsed the picket or its goals, it clearly put the onus of responsibility on any danger to them on police. ILWU’s stance was a constant reminder that it was police violence, conducted with the same less than lethal weapons that Urban Shield will be hawking in just a few weeks’ time—and that are plainly visible in Ferguson’s militarized police arsenal—which served as the pretext for their walking away from picket lines. This can’t be overstated. A new kind of solidarity, perhaps tenuous and ephemeral, was formed via common cause and mutual aid in the port of Oakland under impossible to predict circumstances. The sudden cooperation between two groups sharing the same space in different ways, from vastly different points of view, but focused on undermining the same target, is something I can’t say I’ve ever witnessed. Real connections based on shared experience and mutual respect were formed between rank and file workers and protesters, an invaluable side-benefit that certainly could have gone the other way, as was the concern. Ironically, despite being the least effective and most disorganized call-out of the entire period, Tuesday night and Wednesday morning had the highest numbers of positive interactions with rank and file workers at the port. The incredible amount of energy and strength available for direct actions against Israel and other targets has been unprecedented. 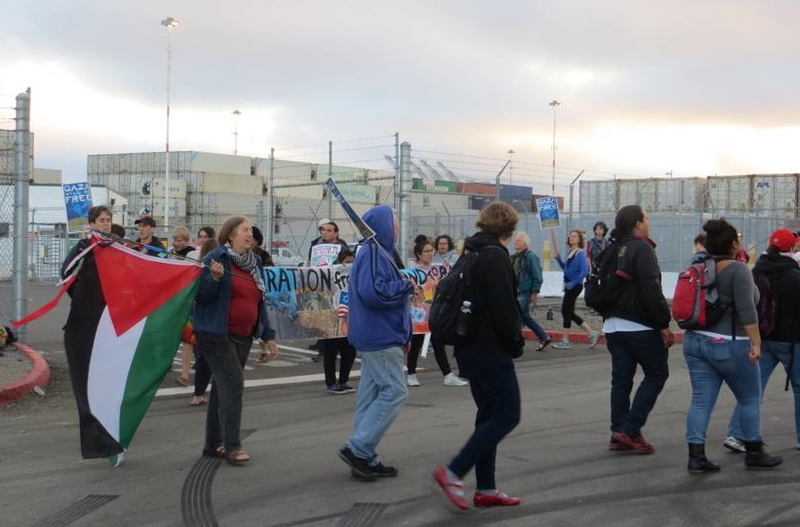 The fact that thousands of people showed up to block an Israeli boat and still came out on subsequent days, often lacking the same organized call out, is a game-changer for efforts of all kinds in Oakland, and other cities. This new reservoir of direct action energy is viable, scalable, affordable and most of all, popular. Never before have activists had a weapon that can cost the state of Israel so dearly. The Zim lines an acknowledged Israeli security asset, were severely hobbled in the space of a weekend. More than this, the coalition’s efforts have revealed a new paradigm of large-scale direct action. Because it’s clear that neither autonomous actions, nor coalition-directed organizing alone produced the myriad successful effects. The Block the Boat Coalition would have stopped short on Monday night and called that a success, and they’d have been right to. It would have clearly been an unprecedented success. Autonomous groups would have met quiet failure at the port without the coalition organizing—indeed, the unsanctioned group which met at 5am on August 2nd didn’t even consider going to the port. Of course, they wouldn’t. Before Monday morning, August 18th, who would have ever thought a picket of a dozen people would stop a 290 meter long container vessel from unloading? But without Monday’s action, made more inspiring because of its scant numbers, the second shift organizing would not have been pulled into gear. And without behind the scenes aid from coalition organizers Monday night, a different outcome may have proceeded, with no reason for the organizers to pull out the text blast for Tuesday morning when they declared their final official victory. Clearly, in fact, anyone predicting Tuesday night’s outcome, with an initial 20 or 30 assembled almost exclusively on line in an hour, would have certainly not wanted to venture anything closer to success than humbling, rather than humiliating, failure. Indeed, the actual planning and execution of the action alone can’t be said to have created much impact on the Piraeus. But as organizers have attested to in their interactions with rank and file longshoremen, that last ditch failed effort led to an oddly beneficial mutually appreciative relationship. Even friendly longshore workers earlier in the day had predicted that workers would begin to openly resent picketers soon and that the cause would suffer because of it. The opposite outcome happened, with Zim and Ports America, not picketers, being the focus of ire, the best outcome for this kind of direct action. Despite all predictions of workers turning against the action, instead, by Tuesday night, workers were contacting organizers with calls of support and information. Even allied workers from around the port industries got into the act, with ferry workers sharing information about the boat’s final movements with organizers. Contrary to conventional wisdom in this case, it was the extended and eclectic series of events that created a sense of emotional investment in some workers, leading them to become literally inspired by the heroic efforts of the heroes in this underdog saga. Going forward, the relationship with ILWU could indeed become troubled if Block the Boat proceeds with more actions, and to be clear, Local 10 was in unique circumstances owing to an ongoing dispute that leaves them without a contract. But just as likely, given the divisions in the rank and file, Block the Boat has a new fanbase that provides a multitude of potential benefits. Ideally, no one person or organization can plan for smooth effects from the combination of ad hoc and institutional organizing, but just as clearly, with Block the Boat Oakland’s spectacular success as case study, the potential for victory increases when freedom and communication exist between the organizers to autonomous actors. In each phase of the organizing, the actors urged, inspired and, indeed, goaded each other into topping the last success, in a progression of dice-rolling that neither group alone may have been willing or able to accept in terms of potential losses. The experience of Block the Boat Oakland suggests that autonomous actors and institutional actors should be especially understanding to one another, and give each other the maximum props, support and freedom to organize. Here is an account of the four days of action by one of the autonomous activists, well worth reading. *When I write of autonomous vs. coalition actions, I am also referring to individual members of the coalition who often worked autonomously outside of the organizing structure of the BTB coalition. Wow! What an inspiring story of Block the Boat’s success.